Garden room designers such as Outside In Garden Rooms will work closely with you to design a building around your specific needs. This is a particularly important service when you are creating a building that will be used for work. Outside In Garden Rooms designed this contemporary style garden office for an IT consultant so he could work from home. While the 3m x 3.6m building is a common style, the layout and electrical specification have been tailored around the specific needs of this client. Several monitors will be used in the office, so thought was given to how the sun would reflect on them. Many people overlook the sun’s orientation and light pattern when designing a garden room. But, a little thought at the design stage can enhance the long-term usability of the room. In this case, thought was given to the positioning of the doors and windows in relation to where the monitors would be set up. It was decided that a set of sliding doors be positioned on the front wall with a small rectangular window on a side wall. The window not only lets in extra light but can be easily opened to ventilate the room. The canopy that runs along the front of the building, above the sliding doors, is a clever design addition. This will create a natural shading when the sun is at its highest and brightest in the summer, yet not block vital natural light entering the room in the winter months. 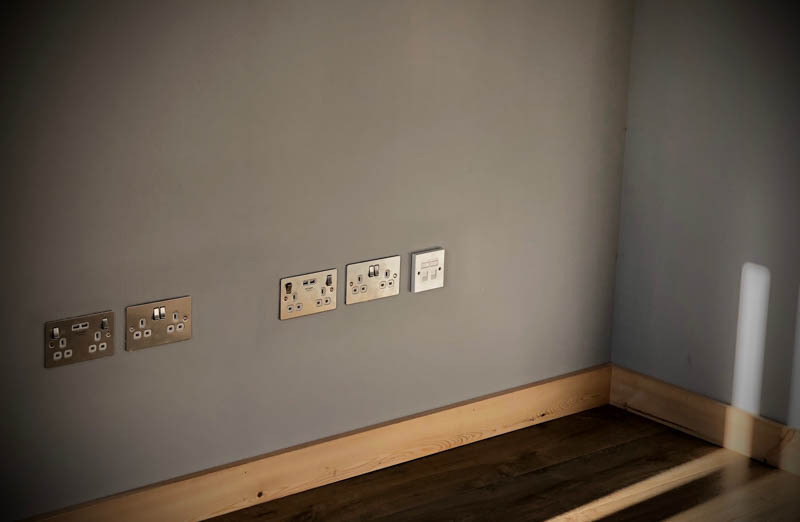 The electrical specification was another important factor in this project. The office needed not only the normal lineup of light and power points but also USB charging points and data cabling for a reliable internet connection. The Outside In Garden Rooms team incorporated all of these needs into the specification, fitting them with stylish brush steel faceplates. Two electrical circuits were wired in the office, to ensure that the lighting system does not ‘clash’ with the computer equipment.